Dr. Mulholland, a visiting professor in the University of Oregon’s Department of Architecture, explored her extensive background with the medium of light in her lecture, “Explorations in Light” presented to audiences in both Eugene and Portland, January 2011. Professor Mulholland has been teaching design in the Architecture and Visualization Departments at Texas A&M; her career background has provided her experience in theatrical lighting, practice as an architectural lighting designer and rendered her a light artist through her PhD dissertation research. She is also involved with the International Association of Lighting Designers, a non-profit that works towards lighting education. Mulholland holds a degree in archaeology from Rutgers, a masters in interior architecture from the University of Oregon, and a PhD from Texas A&M University. Mulholland was designated to receive the Frederick Charles Baker Distinguished Visiting Chair in Light and Design at the University of Oregon for 2011. The Baker Distinguished Visiting Chair is a position of merit that brings distinguished faculty to the University of Oregon and recognizes the work of current UO professors in the field of light and design. Mulholland was recently called “…an instrumental part of promoting the architectural lighting design profession” by the IALD. Her fascination with light as a medium of incredible impact was illustrated in her recent presentation. Mulholland’s light theory revolves around the key concept that light has the “ability to evoke emotion.” She cited examples such as the Vatican lit by thousands of candles, fireworks, political rallies, and amusement parks and casinos—each of these locations effectively use light to sway and influence human experience and response whether to create excitement, generate emotionally-moving environments or foster images of power and strength. Her studies of light show a fascination with observing the qualities of this medium and recognizing in each a specific and unique aspect: shadow, light and the place it falls on; reflection, glittery, jewel-like sunlight on water; color, intense color can influence emotions; and glow, a visible manifestation of power and strength. Mulholland’s colorful and innovative experiments with light have resulted in her dissertation which intimately explored the use of light and light in a place. Relocating to the Big Bend area of Texas to carry out her investigations of light and perception, Mulholland devised an experimental project to analyze the effects of light when the element of colored glass (or plastic) was introduced. 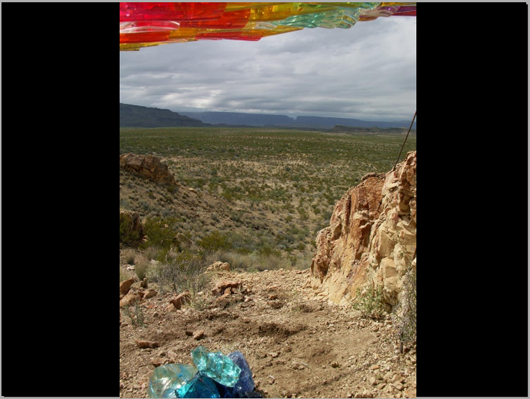 To fully explore this idea, she took plastic glasses into the backcountry of the Texas high desert, literally hiking-in her materials and spending countless hours observing how light interacted with the saturated hues of the plastic. 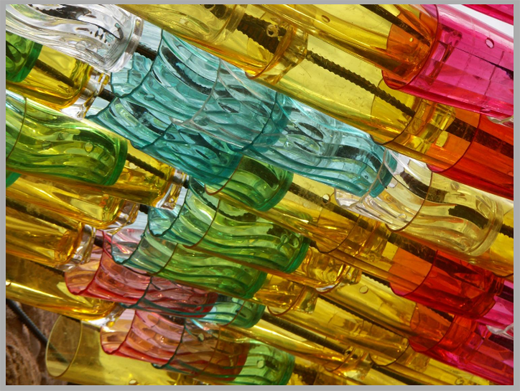 Her installations provided her the requisite illustration of light in a place and light interacting with an environment. 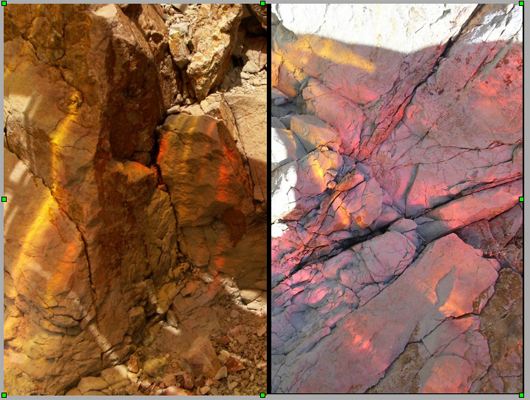 These images of light with the brilliant Texas sun inspired her to visualize her work as an art form, and, as she comments, she “came out as a light artist.” Shown here is one of Mulholland’s four experimental light pieces “to make people more in touch with the places they were in.” This installation was located at Big Bend National Park and crafted out of colored plastic cups purchased from Target and Costco. I lived in Oregon from 1981 to 1999, in Eugene and Portland, so it is really nice to be back, especially since the sun is shining in the last month I have been here. I enjoyed giving the Eugene lecture. The Portland lecture [had] many interesting questions and lots of positive comments afterwards which made me feel like a celebrity for a few hours. Nancy Cheng’s warmth and support were incredible…. In terms of the work on the PhD, it was both the most challenging and rewarding creative endeavor I have undertaken and I am still hopeful it will lead me somewhere new….I never dreamed it would have an archaeological aspect that would take me back to my undergraduate degree in the archaeology of the Maya.